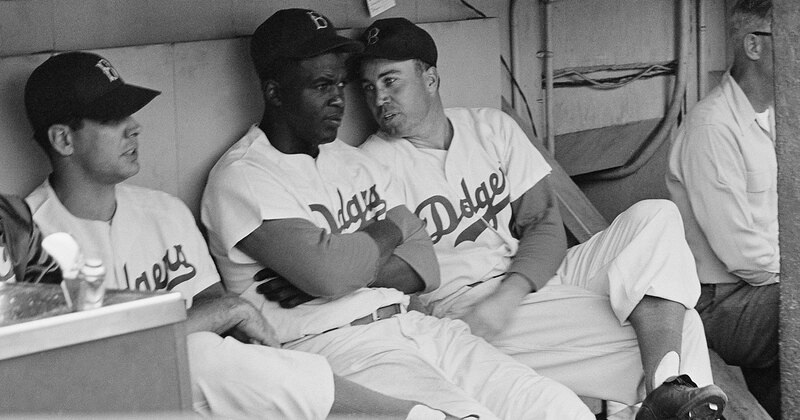 Jackie Robinson and Duke Snider, 1953 Photograph by Kenneth Edie Museum of the City of New York, The LOOK Collection. Gift of Cowles Magazines, Inc.
As part of the new Meet the Curators tour series, wear your No. 42 jersey and join Susan Johnson, Senior Curatorial Associate, on Jackie Robinson Day as she guides you through the exhibition In the Dugout with Jackie Robinson: An Intimate Portrait of a Baseball Legend. See some 30 images from the Museum’s collection of Robinson and the Dodgers taken for Lookmagazine. Along with memorabilia, and rare home movies of the Robinson family, these stunning photographs provide a window into the media’s portrayal of this groundbreaking figure. Ask questions, give feedback, and learn something new with your fellow New Yorkers (or New Yorkers at heart.) A truly behind-the-scenes experience. Meet the Curators allows participants to delve deep into our exhibitions with those who know them best. View the full tour series. Email groups@mcny.org or call 917.492.3403 for additional information.